secret codes of our night. Corey Mesler has published five novels, Talk: A Novel in Dialogue (2002), We Are Billion-Year-Old Carbon (2006), The Ballad of the Two Tom Mores (2010), Following Richard Brautigan (2010), and Gardner Remembers (2011), 2 full length poetry collections, Some Identity Problems (2008) and Before the Great Troubling (2011), and 3 books of short stories. 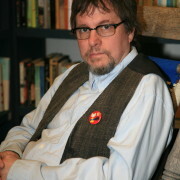 He has been nominated for the Pushcart Prize numerous times, and two of his poems have been chosen for Garrison Keillor’s The Writer’s Almanac. He also claims to have written “Coronet Blue.” With his wife, he runs Burke’s Book Store in Memphis TN, one of the country’s oldest (1875) and best independent bookstores.